Book Covering Duraseal Adhesive 5 metres x450mm- Low tack with easy application and repositioning- No PVC and chlorine free. Book Covering Duraseal Adhesive 10metres x450mm- Low tack for easy application and repositioning- No PVC and chlorine free. Book Covering Duraseal Adhesive 15metres x450mm- Low tack for easy application and repositioning- No PVC and chlorine free. 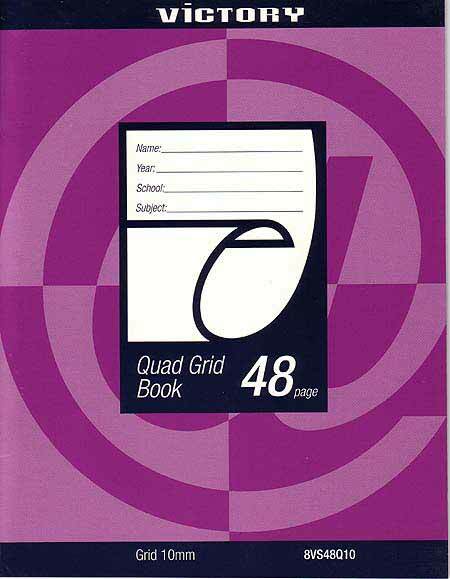 Victory Quad Exercise Book 23cm x 18cm - 48 page 10mm Grid. Office Pads A4 Ruled Pack of 10 - High quality ruled bank paper, 7mm ruling. Office Pads A4 Plain Pack of 10 - High quality plain bank paper.